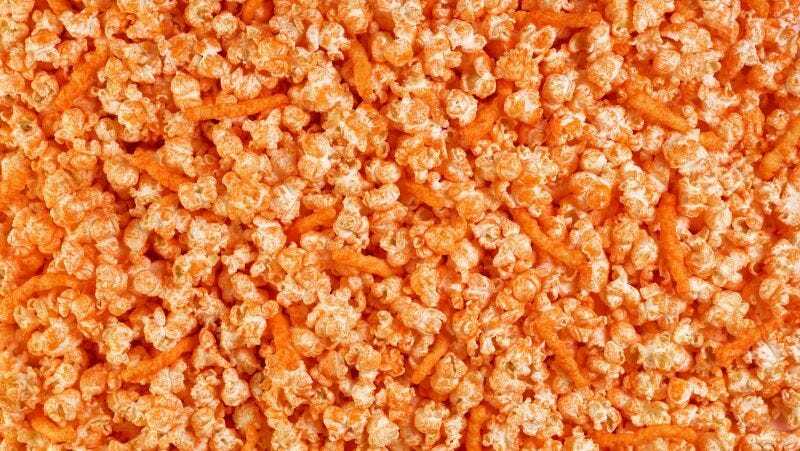 How Stoked Are You to Eat Popcorn Covered in Cheeto Dust? Like grits and potatoes, popcorn is best utilized as a vehicle upon which you can load as much butter and other garbage as your wheezing heart desires. Yeah, it’d be weird to eat a stick of butter like a banana, but melt it over popcorn and it’s fine. Normal, even! Which is why I am completely on board with the news that Regal Cinemas will soon offer popcorn covered in Cheeto dust, just as Satan intended. The Takeout reports that starting tomorrow, the theater chain will begin selling 32 oz. cups of Cheeto-coated ‘corn, studded with actual Cheetos. I am less into the latter part because I don’t like surprises, but on the whole, it’s a good plan because Cheetos are good and popcorn is good, too. Nothing against the Alamo Drafthouses of the world, but when I go to the movies, I want to stuff my body with as much synthetic trash as possible without hurling on my seatmate. Get that salmon salad away from me! GET IT AWAY! Having said that, I will never understand the bridge trolls who mix popcorn and M&Ms. You all disgust me.